The Changing Lives of CatsSmelling of Roses? The Moosey animals enrich my every day in the house and the garden. And, best of all, their stories and photographs are shared with others. My cats sometimes get more 'fan mail' than the Head Gardener does! Many Moosey cat (and dog) faces can be found in vet brochures and posters all over the world - and in an animal website or two. This way, dearly departed pets live on in the real world, as well as in my memory - and in the memorial areas in my garden. It's extremely heart-warming. I guess I do have my favourites (apologies again to the sheep, but you lot don't quite make it). I'm a huge cat-lover, and have always had more than one cat sharing my house and life. I particularly love it when the Moosey cats inspire others. And when they're used creatively in art pieces I'm really thrilled. 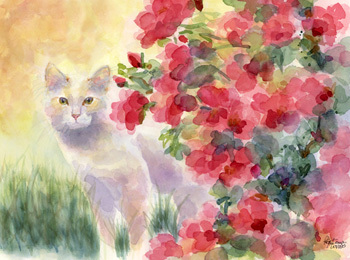 A water-colour of my beloved white cat B-Puss, peeping around the roses, recently featured in an art exhibition in West Virginia. This painting takes pride of place on a wonderful cat calendar - on the cover, no less. Dear B-Puss - you will always be a shining star! Now little Mugsy, the oldest, wobbliest cat (and still thankfully with us) has inspired another talented artist. 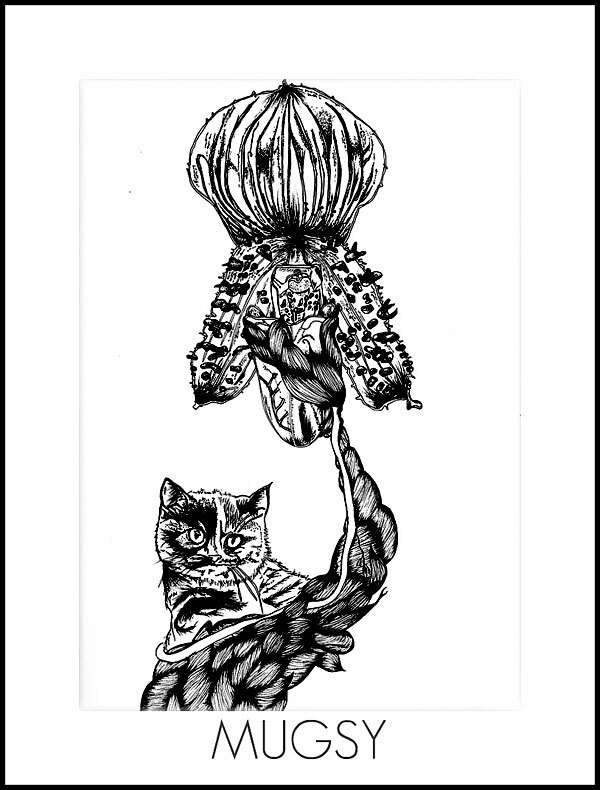 The black and white drawing of Mugsy, with a slipper orchid, is really beautiful. Go Mugsy! Thanks to the artists for letting me show their work. Mugsy's piece can be seen on Clara's blog, and B-Puss pops up on Pamela's website. 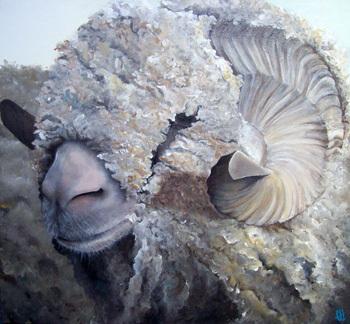 Charles the ram was painted by Fransesca - her website will be up shortly. The Changing Lives of Cats	Top Smelling of Roses?